Online higher ed is slowly shedding its inferiority rap. In a recent Gallup and Lumina Foundation survey, 37% of respondents agreed or strongly agreed that online schools provide a high-quality education. That’s up from 30% in 2011. The steady increase in online education’s popularity and perception is a double-edge sword for colleges and universities that are mostly or exclusively brick-and- mortar operations. For example, online-only schools’ lower overhead costs often mean they can price their tuition lower than traditional colleges. But when those traditional colleges are public, it’s tough for them to keep tuition low if they’re in states with flat or declining higher ed funding. So it’s no surprise that many traditional colleges are increasingly going online, which enables them to tap a bigger pool of potential students but without the additional capital cost of more buildings. As perceptions about online quality increase, so does the addressable market. Hence the trend toward not just more lecture capture, but also higher quality productions. Faculty and students increasingly expect more than just, say, a single camera that spends the entire lecture locked onto the podium or the PowerPoint deck on the dropdown screen. Campuses won’t go the way of the slide rule anytime soon, and more lecture capture gear is just one of the ways they’re evolving technologically. Another example is changes in how projectors are used. (Pictured above) Contemporary Research’s QMOD-HDMI 1.5 employs new HD encoding technology, ideal for facilities such as universities. (Below) Marlboro College Graduate School features projection technology. 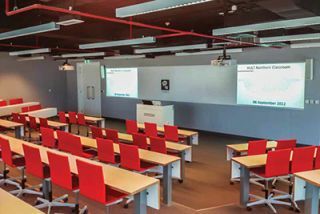 “We see continuing use of projection screens with a traditional projector, but with some new twists,” said Jim Hoodlebrink, Draper information display systems product manager. “There is better interactivity, with integration of touch pads and electronic participation. But in classrooms, exactly the opposite trends is playing out; some schools are replacing projectors with displays. “I’m seeing the trend toward displays,” Rasberry said. “We put together a new collaboration space that’s based on groups rather than traditional classroom seating. Whereas we used to have smart projectors and short-throw projectors, we decided to go with the new smart displays because of the advances they’ve made in quality with the LEDs. The learning environment in many classrooms and even auditoriums is evolving away from nonstop lectures and toward more give and take. That trend is driving purchases of collaboration technology. Collaboration often includes student- and faculty-owned tablets, smartphones and laptops, as well as devices such as Apple TV, Google Glass and Chromecast. That creates challenges for AV/IT staff when it comes to ensuring that a room’s systems have, for example, the right physical interfaces. Faculty and student expectations about what’s possible and preferable in the classroom often are set by the experiences at home. “Apple TVs and Chromecasts are easy to use at home, [and] users would like to be able to simply pop up the same devices in classrooms,” said Lee Bandman, Syracuse University wireless network architect and network engineer. “The ignorance factor is in having no idea what a terribly poor job the device makers do in building in any suitability for use on business-class networks. The bring-your-own-device (BYOD) trend—and all of the challenges it creates — isn’t limited to content sources, either. What’s next in higher ed? BYOD highlights another challenge for higher ed tech managers: keeping their systems as future-proof as possible. One way is by choosing products whose features are determined more by software and firmware than hardware, as well as cloud-based solutions. For example, Mersive’s Solstice collaboration platform is designed to work with off-the-shelf computer and network hardware. Lecture capture is an example of how products that are software-centric, use commodity hardware, or both, enable savings that enable wider deployments. A professor uses Draper’s Scribe, an interactive whiteboard screen with a unique feature-set. In some cases, old technology is getting new life. For example, many dorms and classroom buildings got category cable as computers became common. Then Wi-Fi came along and idled a lot of that cable. Some vendors see category as an opportunity to create subnets to offload certain types of video so it’s not clogging up the main network. That reuse also could enable distance learning in dorms and Greek houses. Reusing old infrastructure is one way to stretch the budget. Another trick is to look for products that can support disparate applications, possibly to the point that it creates opportunities to dip into non-AV funding, such as the security budgets that many schools fattened following tragedies including the Virginia Tech shootings. For example, Kramer’s latest scaler-switchers include emergency-alert features. Whether it’s by finding new ways to reuse old infrastructure, getting creative with budgets or using new online technologies to serve more students, every penny makes a difference. Tim Kridel is a contributing writer for NewBay Media’s AV Technology and Sound & Video Contractor. In the business world, collaboration is as common as khakis. So by deploying collaboration products, colleges such as the University of Michigan’s Ross School of Business are preparing students for the real world while riding the higher ed trend toward teamwork. Ross is using Mersive’s Solstice software, which lets students and faculty use their smartphone, tablet or computer to connect to, share and control a display simultaneously over an existing IP network. For example, students can share content wirelessly, which means AV and/or IT staff don’t have to worry about whether all of the right connectors are there for the myriad devices. A collaboration solution isn’t much good if students and faculty struggle to figure out how to use it, or if the AV or IT department has to do a lot of hand-holding. Hence the importance of an interface that’s’ intuitive enough for everyone. “Solstice was very carefully designed to allow for a broad continuum of user familiarity: from new user to experienced user, and from tech savvy to tech indifferent,” said Rob Balgley, Mersive CEO. “The current version allows a user to share and control content with as little as two button clicks. More advanced users will find they can incrementally explore additional functionality without ‘getting lost’ or ‘breaking’ the UI, which was designed to be rugged and intuitive.